A large fire broke out at Notre-Dame Cathedral in Paris on Monday, April 15, causing massive damage to the historic monument and bringing the entire city to a halt as Parisians and tourists gathered in the streets to watch the cathedral burn. The historic blaze brought down the cathedral’s 19th century spire and two-third of the roof, and caused immense damage to the structure. Historic artifacts and art were rescued from the flames. During the first four hours of the fire, firemen struggled to contain the blaze — and for a while weren’t sure if they could. “The next hour and a half will be decisive,” a spokesman for the city’s firefighters said at 9:30 p.m. Paris time. The fire was reported to have started just before 6:30 p.m. in the cathedral’s attic. The people inside Notre-Dame were quickly evacuated with no information given as to what was going on. Engulfed in flames, the cathedral’s spire collapsed just before 8 p.m. Gasps and cries rose from the crowds as it split in two, the top half diving into the flames. The roof began to collapse around 8:15 p.m. when the flames were 20 to 30 feet tall. At 9:01 p.m., a reporter for Le Monde shared a photo on Twitter showing smoke billowing from the left northern tower. It was only at 11 p.m. that Gallet, announced that the situation was under control. 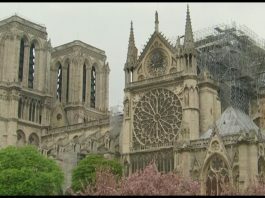 “We can consider the structure of Notre-Dame saved and preserved in its entirety,” he said. “The fire has diminished in intensity,” added Secretary of State for the Interior Laurent Nuñez. The last of the flames were extinguished by the following morning. 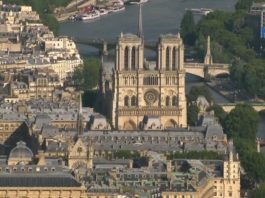 The cause of the fire is unknown, but French media has quoted the Paris fire brigade as saying the fire is “potentially linked” to massive renovation project happening on the cathedral’s spire. The scaffolding, built all around the spire and over the roof for the renovations, is still standing over a now empty space where the top of the cathedral used to be. On April 16, a clearer picture began to emerge. A fire alarm first went off at 6:20 p.m. local time, leading security guards to evacuate the cathedral even though they didn’t see any sign of a fire. The alarm rang again at 6:43 p.m., and this time the security officers noticed the fire, confirmed Paris Prosecutor Rémy Heitz in a press conference. Prosecutors have opened an investigation into the cause of the fire. Miraculously, no injuries have been reported. 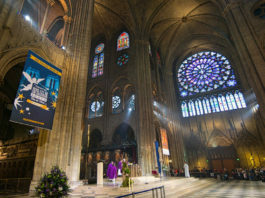 Bernard Lecompte, an expert in religious history, called Notre-Dame, “The heart of paris, the heart of the history of France.” The cathedral houses incalculable works of art of great value and importance, especially to Catholics. In 2017, 12 million people visited the Notre-Dame de Paris cathedral. Approximately 30,000 people visit the monument every day. Firefighters are fighting the blaze from cherry picker cranes beside the cathedral. At 226 feet tall, the cathedral is a difficult place to put out a fire (firefighters prefer to put out fires from above, which isn’t possible at Notre-Dame). The Secretary Nuñez, told a press group in Paris that 400 firefighters were mobilized to fight the fire. White smoke first began rising from the spire — the highest part of the cathedral at 295 feet. Around 8 p.m., a church official told NBC News the wooden interior was burning as well and was likely to be destroyed. 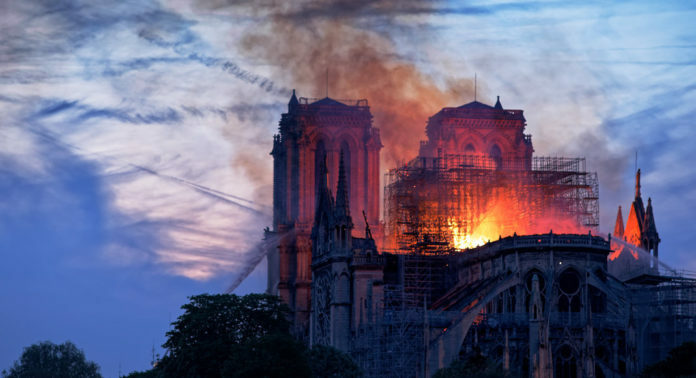 Though the facade and building is largely made of stone, the roof, the spire, the interior, and part of the structure are made of wood, leaving it particularly vulnerable to fire. Many pieces of art and historic artifacts were rescued during the fire. Also escaping the blaze are sixteen copper statues which were moved from the roof just days ago because of the restoration. A major fire is underway at the Notre Dame cathedral in Paris, one of the French capital city’s best-known landmarks. Macron postponed a televised speech about how he was going to reunite the nation after months of gilets jaunes protests. In a statement, a spokesperson for the French president said: “Due to the terrible fire ravaging Notre-Dame-de-Paris, the President of the Republic has decided to postpone his speech.” Macron and the Prime Minister Edouard Philippe arrived on the scene around 8:30 p.m.
A fake CNN Twitter account tweeted that the fire was a terrorist attack. France24’s Twitter account that educates the public about fake accounts and images quickly tweeted out that it was false.